The Northern Star exhibition runs until the 9 January 2016 at the Platform Gallery, Clitheroe, Lancashire. I took these photos during the 3 days I spent there with my jewelart pop-up ‘wired designs’ exhibition in the education gallery space at the far end of the gallery. The visitors to the gallery that I chatted to, were very impressed and loved the exhibition. A great showcase of handmade craft! Enjoyed taking part in this year’s Lytham Arts Festival and meeting some interesting people… friends that popped by to say hello and see my display at Stringers Homelife, visitors interested in chatting to me about my work, watching the demos or having a go at making their own pair of shell bead earrings and it was also a great opportunity to get to know some of the other artists taking part in the festival. On the last evening, I used the festival guide to help me visit all the shops taking part and see a variety of artwork displayed in their windows (due to it raining, I didn’t take any photos). 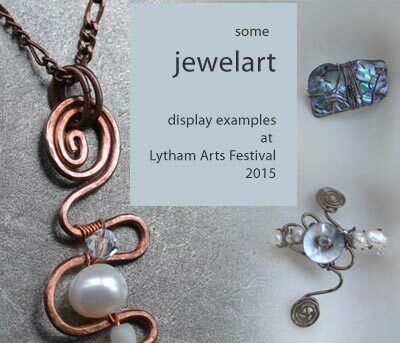 The Lytham Arts Festival brings art into the heart of Lytham and in 2015 over 70 artists will exhibit, perform and entertain from over thirty venues in the town (text from the Lytham Arts Festival website). I’m looking forward to being part of this years festival and have been partnered with Stringers Homelife, next door to Booths. During the festival 4-11 July, I will have a small window display of selected seaside theme jewellery pieces and on the festival weekends I will be there with a bigger display of my work, demonstrating and doing tasters. watch me making celtic style pearl and shell earrings using a jig to create wire shapes, as well as other wire manipulation techniques to attach a pearl drop and earring hooks. come along and have a go creating a pair of your own bespoke shell beaded earrings using tigertail thread and plated ear hooks. Its a really easy, fun activity and your earrings will only take you 15-20 minutes to create. Its a free to take part and suitable for adults and children (from 6 years old with adult supervision). make your own bespoke beaded cord bracelet with shell beads and button fastener. Lytham makes a great day out, there is a great variety of independent shops, lovely coastal walks and cafes. On Saturday 4 and Sunday 5 July, the Gallery at Brockholes are having their launch weekend. Ideal if you are travelling over to Lytham and want to combine it with a visit there. Gallery at Brockholes is run by the Art & Craft Guild of Lancashire, made up of a wide range of the finest local artists, designers and makers. A great selection of ceramics, textiles, jewellery, glass, art, photography, furniture and turned wood. There are 4 themed exhibitions each year featuring different guest artists from the area.